Wahama senior Christopher Hesson (right) kicks in one of three extra-points with sophomore Brayden Davenport (11) as holder, during the White Falcons’ loss on Sept. 8 in Racine. Last Week: Cameron defeated Bridgeport 52-6, in Bridgeport; Hannan lost to Phelps 50-0, in Phelps. Last meeting between the teams: Nov. 7, 2014. Cameron won 2-0 by forfeit. Current head-to-head streak: Cameron has won 1 straight. CHS offense last week: 203 rushing yards, 78 passing yards. CHS offensive leaders last week: QB Colby Brown 6-9-0 78 yards, 2TDs; RB Andrew Ritchea 7 carries, 153 yards, 2TDs; WR Travis Mickey 2 receptions, 60 yards. CHS defense last week: (-7) rushing yards, 141 passing yards. 1. The Wildcats have one final chance to play in front of their home fans this fall and end their current four game-losing skid. The Blue and White are 6-16 in their last 22 season finales, but 2-2 in their last four. 3. Common opponents between CHS and HHS are Hundred, Paden City and Beallsville. The Dragons defeated all three, by an average of 37 points. Hannan topped Hundred by 41 points, but fell to PCHS and BHS by an average of 26.5 points. 4. Hannan has been outscored by a 276-to-106 clip this fall. CHS has outscored opponents 412-to-110 this season, pitching a pair of shut outs. This is the first year since 2013 that HHS will have taken the field for 10 games. 5. The Dragons are currently raked seventh in Class A playoff ratings, while Hannan is ranked tied for 37th. CHS is one of eight Class A teams with one loss or fewer, with the Shenandoah Zeps as the only team to defeat Cameron this fall. Last meeting between the teams: Nov. 4, 2016. Buffalo won 60-14 in Buffalo. Current head-to-head streak: Buffalo has won 3 straight. WHS offense last week: 223 rushing yards, 39 passing yards. BHS offense last week: 114 rushing yards, 274 passing yards. WHS offensive leaders last week: QB Coltyn Hendrick 2-2-0 23 yards; RB Christian Thomas 19 carries, 155 yards, 2TDs; WR Colton Arrington 2 receptions, 23 yards. WHS defense last week: 160 rushing yards, 67 passing yards. BHS defense last week: 198 rushing yards. 1. Buffalo and Wahama have played every season since 2003. During the current series, WHS holds a 9-6 record over the Bison. 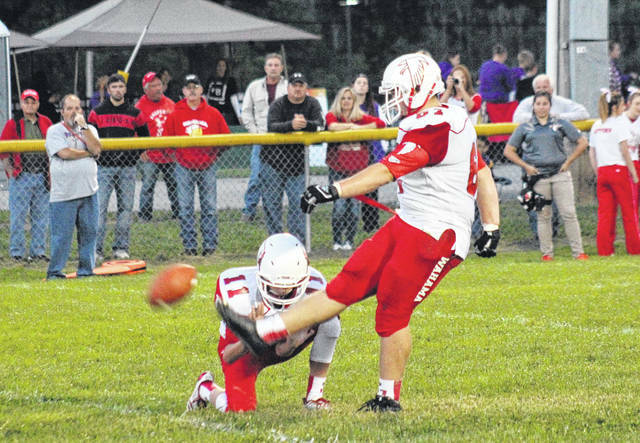 Wahama’s last trip to Putnam County was on Nov. 6, 2015 and resulted in a 66-27 BHS win. 2. During Wahama’s current three-game winning streak, the White Falcons have rushed for 923 of their total 991 total yards. During that span, WHS has been successful on 6-of-9 extra-point kicks and 2-of-3 two-point conversion tries. 3. Through nine games, Wahama has averaged 218.2 rushing yards and 31.4 passing yards per game. WHS has earned a total of 124 first downs this year, while scoring 20.2 points per game. 4. The Wahama offense has been led by Christian Thomas this season, as he’s rushed for 1,078 yards and 19 touchdowns on 164 carries, while also catching a touchdown. 5. In the Class A playoff ratings, Wahama is tied for 23rd, while Buffalo is tied for 32nd. The White Falcons are one of four four-win teams and are trying for their first non-losing season since 2014.